We're the Camps. We camp. It's something we've done together since the beginning. Jonathan and I have pitched two-person tents in Yosemite and Grand Teton and Joshua Tree, as well as myriad other campgrounds in the eastern Sierra. When we moved to Norway, we brought all our camping gear along for the ride, including both our 3-season and 4-season North Face tents. In the last five years, we've camped out on Kvalvika Beach in Lofoten and in the shadow of Galdhøpiggen, Norway's tallest mountain, but mostly we've stuck close to home, trekking not so very far into Oslomarka, the wilderness area surrounding the capital city. Having the marka so accessible is one of the reasons we love living in Oslo. Two years ago this month, we traveled to Bodø in Nordland to chase the midnight sun . We rented a little fishing cabin to allow us to travel light. What we didn't know then was that the girl basking in the glow of midnattsola --slathered in bug repellant, signing the guest book tucked into a tall cairn at the lookout, and grinning victoriously at her husband--was a couple weeks pregnant. That was the last "camping" adventure we had before our daughter was born in April of 2015. Last summer, camping couldn't have seemed more impossible. Our little Cheeks McGee was a born screamer, and her mama's best coping mechanism was a controlled eating and sleeping schedule. The babe was six months old before we attempted putting her to bed anywhere except her own crib. That trip to Berlin proved she could be a champion overnight sleeper no matter where we went, but it was already October, and the window for camping in Norway had closed. When my semester ended in May, I was craving some time in the woods. I hauled our camping bins up from the cellar and inspected the contents. If we wanted to pull off any camping trips this summer, there was much to be done and much to be acquired: a tent to accommodate three people; sleeping bag for the babe; a backpack-style carrier; a new first aid kit. On top of that, it's been five years since we owned a car, so any camping trip here requires backpacking, as well. This was no problem in the old days. We tramped many, many miles with 20-25 lb packs. Now one of us would also be shouldering a growing toddler, along with her proper-care-and-feeding miscellany. But I was determined we wouldn't miss another summer. 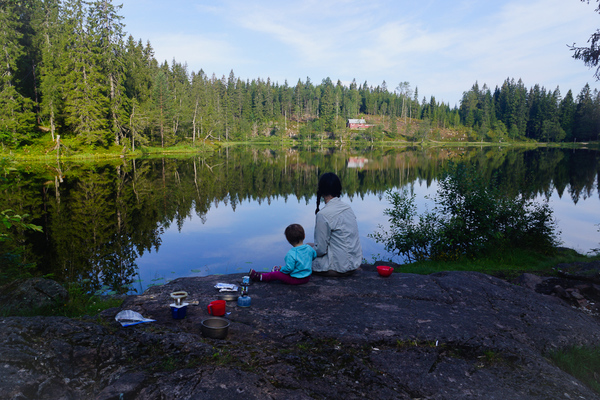 It was time to go camping in Oslo with a baby! We started working out in the evenings after the baby was in bed, focusing on strength-training for our glutes, quads, hams, and calves, as well as core exercises. We researched tents and ended up buying an MSR Mutha Hubba NX 3-person , purchased at Oslo Sportslager downtown. Adqequate brand selection; knowledgable staff. An employee allowed us to set up the tent we wanted in the store before we made our final decision. We tried on multiple backpack baby-carriers, ultimately borrowing a Deuter Kid Comfort 3 from a friend. In the weeks leading up to our camping adventure, we tried out the pack around our neighborhood and on a shorter hike. This worthwhile endeavor taught us lots of important things. Especially that my hips were impressively designed to bear children, both in the sense of birth and lugging the kid around later on. When the time came, I would carry the babe; my husband, devoid of hips, would carry almost everything else. We followed the weather forecast, watching for a dry week and weekend. Best weather website for Nowegian weather: yr.no . We made food plans and packing lists. We purchased bug repellant; natural stuff for the babe and her dad and DEET-heavy stuff for her sweet-blooded mama. Also bug-bite reliever. Also a bug-net for the backpack carrier, a last-minute panic-purchase that didn't get used once. All this I found at Chillout Travel in Grünerløkka. Fun little shop with lots of expensive gear, but also a campy cafe and a cozy basement spot to hole-up and plan an adventure. We pored over Den Norske Turistforening (DNT: Norwegian Trekking Association) website and maps, choosing our destination and route. Criteria included proximity to transportation and personal familiarity. We repeated to each other over and over that our bar for success on this outing would be low. Everyone comes out alive = We did it! No pressure. The stars aligned two weeks ago. After several hot, dry days, there was sunshine in the forecast. All three of us were fit and healthy. Jonathan was in town. I was still on summer break. McGee hadn't yet begun barnehage. It was time. Look for future posts this week on the hike itself, along with details about our destination (Skjennungen), and additional commentary on the gear we used. Spoiler alert: It was awesome! Thanks for reading. It's good to be back.